Here's what it sounds like to call play-by-play for one of the world's dumbest criminals. Have you ever wondered what it would sound like to call play-by-play of the bad guys from “Home Alone?” Now we have an idea. 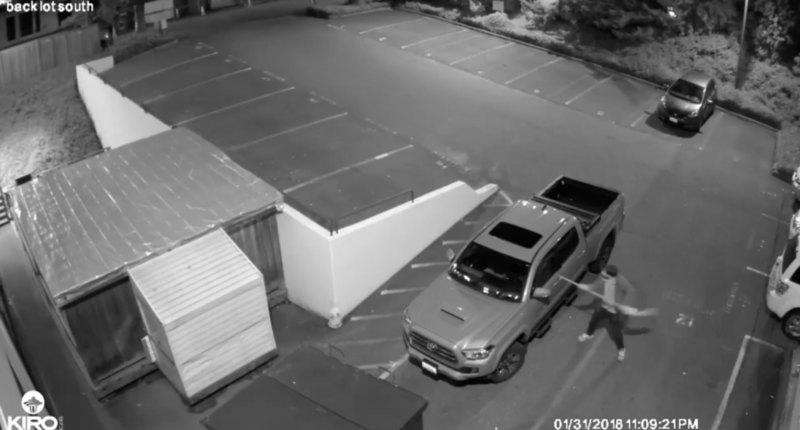 On Wednesday night, Seattle’s KIRO Radio 97.3 captured surveillance footage of a very clumsy burglar attempting to break into an employee’s car using a mop handle. Undoubtedly amused by the man’s ham-handed burglary skills, the station called in local broadcast legend John Curley to narrate the footage. As you can hear for yourself, the result was pretty great. Last night we captured surveillance footage of a vandal trying to break in to one of our employee’s vehicles in our parking lot. While the suspect is still at large, we took the liberty to have John Curley give his play-by-play of the incident. This video does leave us with a pressing question, however: How is the suspect still at large when he was last seem crumpled in a ball barely moving after a fall? You’d think he would’ve been pretty easy to apprehend at that point. There’s probably an idea for a TV show here. Maybe an America’s Dumbest Criminals reboot featuring Al Michaels on the call? Or better yet… Gus Johnson. KIRO really might be onto something.